Tap one of the setlists to view the songs in the setlist. This will take you to the Setlist Songs view. Below is a guide to the parts of the Setlist Song view. Setlist Songs – This shows the setlist song with the sequence number on the left. Setlist Break – You can use this for any sort of break you want. But the intention was for a band to take a break. It contains the total set time on the first line. The second line has the duration of the break. You can also put notes in the break. To show the notes in the setlist songs you need to turn it on in the settings. Editing a Song or Set Break – If you tap the info icon will allow you to edit the song or break attributes. 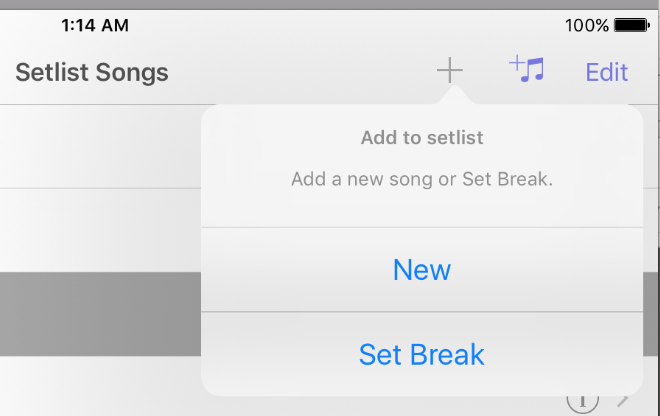 Editing toolbar – These icons allow you to Add New Songs, Breaks, Songs from the Songs List, and rearrange the setlist. More information is below. Setlist Information – This shows the Total time of all the songs and breaks in the setlist. The second line shows the count of songs and breaks. 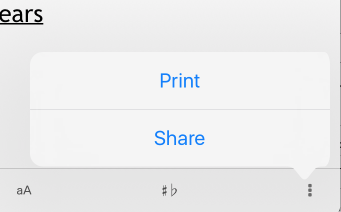 Sharing and Printing – Tap the icon with the 3 vertical dots to Print or Share your setlist. More information is below. Tap the plus button shown in #4 above to add a new song or set break. When you perform either of these actions the new Song or Set Break will be added at the end of the setlist. Moving your these items will be described below. New – Tap ‘New’ to add a new song that is not in the Song Catalog. 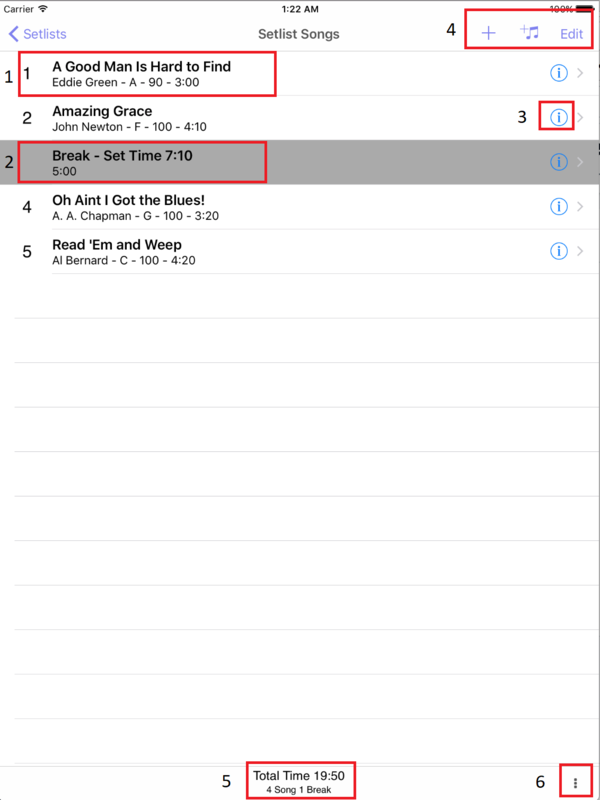 Set Break – Tap ‘Set Break’ to add a set break. 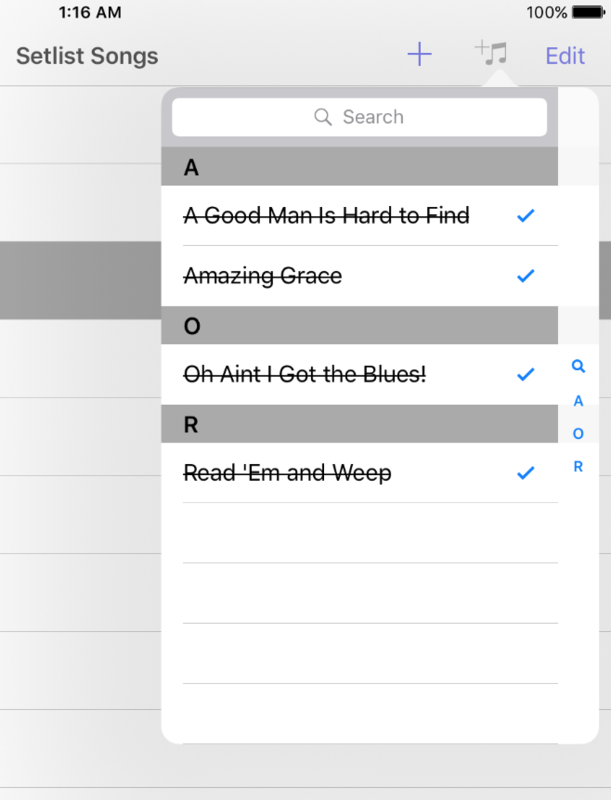 Tap the icon with a plus and music notes to add songs to your Setlist. The view above is the Song Catalog selector. If the song is in the setlist songs it will be check and the text will have a strike through it. If you want to add the song twice tap the marked row again. Tap “Edit” in #4 and it will show you the view below. Tap and hold the icon with 3 vertical lines on the right and move your finger to the spot you want to place the song. If you want to delete a Song or Set Break tap the red circle on the left. Tap the icon with 3 vertical dots on the bottom right and you will see the menu below. Print – Opens the print dialog that will allow you to print the Setlist. 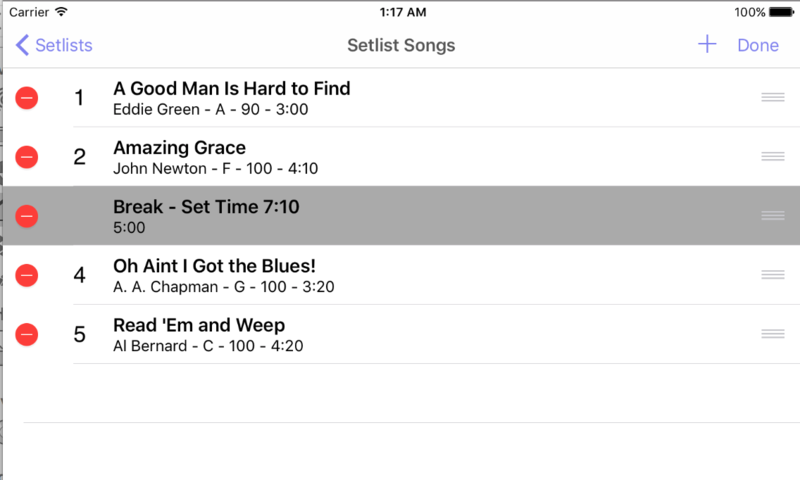 Share – Opens the System share view so you can share the text version of the Setlist Songs. You might use this to email or text the Setlist.